Scavenger receptors constitute a large family of proteins that are structurally diverse and participate in a wide range of biological functions. These receptors are expressed predominantly by myeloid cells and recognize a diverse variety of ligands including endogenous and modified host-derived molecules and microbial pathogens. There are currently eight classes of scavenger receptors, many of which have multiple names, leading to inconsistencies and confusion in the literature. To address this problem, a workshop was organized by the United States National Institute of Allergy and Infectious Diseases, National Institutes of Health, to help develop a clear definition of scavenger receptors and a standardized nomenclature based on that definition. Fifteen experts in the scavenger receptor field attended the workshop and, after extensive discussion, reached a consensus regarding the definition of scavenger receptors and a proposed scavenger receptor nomenclature. Scavenger receptors were defined as cell surface receptors that typically bind multiple ligands and promote the removal of nonself or altered-self targets. They often function by mechanisms that include endocytosis, phagocytosis, adhesion, and signaling that ultimately lead to the elimination of degraded or harmful substances. Based on this definition, nomenclature and classification of these receptors into 10 classes were proposed. This classification was discussed at three national meetings and input from participants at these meetings was requested. The following manuscript is a consensus statement that combines the recommendations of the initial workshop and incorporates the input received from the participants at the three national meetings. Scavenger receptor activity was first described by Drs. Brown and Goldstein (1) when they identified receptors in macrophages that endocytosed and degraded modified (acetylated), but not native, low-density lipoprotein (LDL). Drs. Brown and Goldstein showed that these receptors for acetylated LDL recognized a wide variety of polyanionic ligands (2). Purification and cloning of the corresponding receptor protein and cDNA (3, 4) was soon followed by the identification of other modified LDL receptors (LDLRs) with broad binding specificity. In an initial attempt to systematically categorize these receptors, M. Krieger proposed to subdivide them into “classes” (A, B, etc.) based on their sequences, and each class subdivided further into “types” based on additional variations in their sequences due to alternative splicing (5). There are currently eight classes of scavenger receptors (classes A–H). In some cases, multiple names have been assigned to the same receptor (e.g., MSR1, SR-AI, CD204, and SCARA1). In addition, there are proteins exhibiting scavenger receptor activity that have been named based on other criteria and have not been included in a general scavenger receptor nomenclature. Some examples include RAGE, LRP1, LRP2, ASGP, CD163, SR-PSOX, and CXCL16. New scavenger receptors also continue to be discovered and identified (6, 7). Therefore, it is important to convey consistent understanding and minimize redundancy and miscommunication in the scavenger receptor field. Developing a standardized nomenclature has the benefit of decreasing redundancy and facilitating communication and collaboration among investigators within a field, as well as in different fields, by building on a common understanding. Efforts to standardize other scientific nomenclatures have occurred in areas such as chemokines and their receptors (8), TNF family of receptors involved in bone metabolism (9), complement peptide receptors (10), and glutamate receptors (11). Committees, such as the International Union of Basic and Clinical Pharmacology, formed specifically for these processes by scientific societies or investigators in the field have developed systematic nomenclatures, for example, http://www.guidetopharmacology.org/nomenclature.jsp (accessed April 10, 2016), within each field for adoption by the broader scientific community. To address the lack of a unified nomenclature system for scavenger receptors and better organize the field, the United States National Institute of Allergy and Infectious Diseases (NIAID), at the National Institutes of Health (NIH), represented by M.R. PrabhuDas, initiated discussions with J. El Khoury and Dr. Siamon Gordon which led to organizing and convening a workshop in which 15 investigators from five countries proposed a consensus definition of scavenger receptors and a systematic, standard nomenclature. The workshop participants and their areas of expertise are listed in Table I. The objectives of this workshop were to: 1) establish guidelines and recommendations for standardizing the nomenclature for scavenger receptors; 2) consider strategies for dealing with future discoveries of scavenger receptors; and 3) communicate the recommendations to the wider scientific community as a point of reference and for further discussion and final scavenger receptor nomenclature standardization. The discussion and nomenclature recommendations described herein only refer to mammalian scavenger receptors. The original description of scavenger receptors was in the context of studies of lipoproteins, atherosclerosis, and familial hypercholesterolemia (1, 12). Drs. Michael Brown and Joseph Goldstein (1) had previously identified LDLRs and LDLR-mediated endocytosis and established that familial hypercholesterolemia was caused by loss-of-function mutations in the LDLRs, which led to increased plasma LDL, premature atherosclerosis, and heart disease (1). Analysis of familial hypercholesterolemia patients showed that plasma LDL could be cleared by an LDLR-independent pathway called the “scavenger pathway.” The earliest use of the term “scavenger receptor” to refer to the broad specificity receptor identified by Dr. Brown and Dr. Goldstein was in 1981 by Fogelman and colleagues (13). The first receptors that carried the name “scavenger receptor” were purified in 1988 (14) and cloned in 1990 (15, 16) by the Krieger group and were found to be alternatively spliced gene products of a single gene which were initially named type I and type II macrophage scavenger receptors. When additional scavenger receptors were identified, the type I and II macrophage receptors were renamed scavenger receptor, class A, type I and type II (SR-AI and SR-AII) by the Krieger group. One distinct feature of the broad binding specificity of scavenger receptors was that they could recognize a large repertoire of ligands, ranging from bacteria and yeast to self (native proteins) and modified-self targets (2, 17–21). Besides playing a role in host defense, class A scavenger receptors have been shown to be involved in functions such as homeostasis, Ag presentation, and pathogenesis of neurodegenerative disorders (22, 23). Based on their broad ligand-binding specificities and expression in macrophages, Krieger and colleagues (5) proposed that scavenger receptors could serve as pattern recognition receptors for innate immunity. Work done by groups led by Drs. S. Gordon, M. Krieger, K. Joiner, T. Kodama, and J. El Khoury provided direct evidence that the class A receptors are adhesion receptors, and that they recognize Gram-positive bacteria and β-amyloid, confirming the broad ligand specificity for these receptors (17, 24, 25). Additional members of the class A scavenger receptors such as MARCO (26) and SCARA5 (27) were subsequently identified and demonstrated a role in homeostasis, adhesion, and cancer progression (28). Other multiligand pattern recognition receptors were independently identified, including CD14 (29), mannose receptors (30), and CD36 (31). A report that served as an initial step in presenting the proposed nomenclature to the research community was published in The Journal of Immunology (32). A Web site was set up to invite comments from fellow investigators in response to the proposed nomenclature. The Web site (https://respond.niaid.nih.gov/ScavengerReceptors/) was open for three months for public comment. In addition, NIAID organized several follow-up sessions at the following national meetings: Experimental Biology 2014 in San Diego, CA (http://experimentalbiology.org/2014/Home.aspx), Immunology 2014 in Pittsburgh, PA (http://www.immunology2014.org/), and Federation of Clinical Immunology Societies (FOCIS 2014) in Chicago, IL (http://www.focisnet.org/focis-2014). The sessions were open to the attendees of these national meetings to provide the broader scientific community with the opportunity to provide their comments and recommendations on the proposed scavenger receptor nomenclature. We now incorporate the comments received at the three national meetings and present a unified, consensus, and definitive classification and nomenclature for scavenger receptors. At the initial workshop convened by the NIH, participants developed a definition of scavenger receptors, incorporating the various facets and characteristics of these receptors. This definition was used as the benchmark against which proposed nomenclatures were considered. As mentioned above, scavenger receptors were originally defined as cell surface proteins that bound chemically modified lipoproteins with high affinity. Additional characteristics included the ability to bind multiple ligands (broad-binding specificity), mediate endocytosis, in some cases mediate signaling, and act as innate immune pattern recognition receptors. Based on the discussion, the group agreed upon the following working definition for scavenger receptors: Scavenger receptors are cell surface receptors that typically bind multiple ligands and promote the removal of nonself or altered-self targets. They often function by mechanisms that include endocytosis, phagocytosis, adhesion, and signaling that ultimately lead to the elimination of degraded or harmful substances. Fig. 1 illustrates the consensus nomenclature formula agreed upon at the initial meeting. As an example, a scavenger receptor belonging to class A will be designated as SR-A1, where SR stands for scavenger receptor and is followed by a hyphen, then a capital letter representing the class of scavenger receptor, then an Arabic numeral representing the type of molecule within the class. Alternate splice variants are designated by a dot and an Arabic numeral following the type of molecule within the class (e.g., SR-A1.1). The numbering is based on the order in which the molecules were identified. Proposed scavenger receptor nomenclature formula. SR stands for scavenger receptor. SR is followed by a hyphen, then a capital letter represents the class of scavenger receptor (A–J), followed by an Arabic numeral representing the type of molecule within the class (the numbering is based on the order in which the molecules were identified). Alternatively spliced forms of a molecule will be designated as 1.1, 1.2, etc. For existing spliced variants, the longest variant in terms of amino acid sequence will be given the first number. In the three follow up meetings there were discussions regarding the definition. There were questions as to whether receptors that strictly bind only pathogens should be included. The examples given were for viral receptors for rhinovirus or severe acute respiratory syndrome (SARS) (ICAM-1 or ACE2, respectively). There was also discussion on whether binding to modified self is a requirement. If a pathogen evolved to bind to a host molecule (including lipids) and that host molecule had a completely different primary function(s), one would not consider such a binding molecule on the host to be a scavenger receptor. Another idea proposed included the suggestion that if one of the principal functions of the host molecule is to bind pathogens (multiple pathogens), it could be considered a scavenger receptor even if there is no evidence for modified self-binding. Finally, there were also discussions on whether to include binding specificity and affinity in the definition to differentiate various receptors. However, it was determined that this may not be appropriate for all scavenger receptors because some scavenger receptors bind some of their ligands in the micromolar range, whereas other ligand receptors bind in the nanomolar range. Following the three follow up sessions at Experimental Biology 2014, Immunology 2014, and FOCIS 2014, it was decided to keep the original definition agreed upon at the initial meeting. Tables II and III provide the current and revised nomenclature for mouse and human scavenger receptors. The following sections provide a brief overview of the currently known scavenger receptor classes and the revised nomenclature for each class and member, as recommended by the workshop participants and approved in the three follow up sessions discussed above. Class A scavenger receptors: SR-A. Class A scavenger receptors (SR-A) are expressed primarily on tissue macrophages and macrophage subtypes such as Kupffer cells and cortical and medullary thymic macrophages (33). They have also been observed on high endothelial venules (33) and on subpopulations of dendritic cells (34), binding to a variety of foreign and self ligands. Members in this class have a similar structure comprised of an N-terminal cytoplasmic tail, transmembrane domain, spacer region, α-helical coiled coil domain, collagenous domain, and a C-terminal scavenger receptor cysteine-rich (SRCR) domain. SRCR domains are ∼ 100–110 aa long, with 6–8 conserved cysteines predicted to form 3–4 disulfide bonds that are present in varying numbers in a variety of host defense-related proteins, including different classes of scavenger receptors (35, 36). In some cases alternative mRNA splicing deletes the SRCR domain. SCARA1/MSR1, the prototypical SR-A molecule, was the first scavenger receptor to be cloned and was initially isolated from bovine lung mRNA. It has subsequently been identified in other species, including mice and humans. There are three isoforms, which are alternative splice variants of the same gene that have been identified, namely, SR-AI, SR-AII, and SR-AIII (15, 16, 37, 38). Other members of this class of scavenger receptors include macrophage receptor with collagenous structure (MARCO), scavenger receptor A 5 (SCARA5), and scavenger receptor with C-type lectin domain (SRCL-I/II), also designated collectin, from placenta receptor-I (28, 39, 40). The scavenger receptor currently designated as SCARA1 or MSR1 will now be referred to as SR-A1. SR-A1 is predominantly found in macrophages, monocytes, mast cells, and dendritic cells in both mice and humans (41). A diverse array of ligands is recognized by members of this class. SR-A1 binds to β-amyloid (42), heat shock proteins (43), surface molecules of Gram-positive and Gram-negative bacteria (17, 44), hepatitis C virus (38), and modified LDL such as acetylated LDL (termed AcLDL) and oxidized LDL (OxLDL), but not native LDL (15, 16). SR-A1.1, an alternatively spliced form of SR-A1 (currently referred to as SR-AII), is characterized by a shortened C terminus. SR-A1.2, another alternatively spliced form of SR-A1 (currently referred to as SR-AIII), is characterized by a truncated C terminus and remains trapped in the endoplasmic reticulum. The collagenous region of SR-A1 and SR-A1.1 has been identified as a major site of polyanionic ligand binding (45). There will be no receptor designated as SR-A2 to avoid confusion with the current SR-AII (new designation is: SR-A1.1). Although SR-A1 and SR-A6 (currently known as MARCO) are primarily expressed in macrophages, SR-A3 (also referred to as SCARA3, cellular stress response/CSR), SR-A4 (SCARA4, SRCL, collectin placenta 1/CL-P1), and SR-A5 (SCARA5) are expressed in a variety of other tissues and cell types, including the lung, placenta, intestine, heart, and epithelial cells (46). SR-A3 has been associated with protecting cells from the detrimental effects of reactive oxygen species (21). SR-A4 functions both as an endocytic receptor for lipoproteins and mediates the recognition, internalization, and degradation of oxidatively modified LDL by vascular endothelial cells (47). SR-A5 (currently known as SCARA5) expression is restricted to epithelial cells within the testis, airway, thymus, and the adrenal gland. SR-A5 has the capacity to bind bacteria and may play an important role in host defense (27). Under normal conditions, in the absence of inflammation, the expression of SR-A6 is restricted to macrophages in the lymph nodes and marginal zone of the spleen. Studies have shown that SR-A6 mediates the clearance of bacteria from the lungs (48) and bloodstream (49). SR-A1. The protein is currently known as MSR1, SR-AI, or SCARA1 [prototype]; the current gene name is SCARA1. SR-A1.1. The protein is currently known as SR-AII. This is an alternatively spliced form of SR-A1. There will be no receptor designated as SR-A2. This exception was agreed upon during the meeting to avoid confusion with the current SR-AII, which will now be designated as SR-A1.1. SR-A3. The protein is currently known as MSRL1 or APC7; the current gene name is SCARA3. SR-A4. The protein is currently referred to as scavenger receptor C-type lectin (SRCL) or CL-P1; the current gene name is COLEC12. SR-A5. The protein is currently known as TESR; the current gene name is SCARA5. SR-A6. The gene name is MARCO; the alternative name is SCARA2. The workshop participants recommended that the gene name be changed to SCARA6 for consistency. Class B scavenger receptors: SR-B. Class B scavenger receptors include receptors currently known as SR-BI, and its alternatively spliced isoform SR-BII, as well as CD36 and LIMP2. Receptors belonging to this class are characterized by two transmembrane domains flanking an extracellular loop, with both the amino and C termini located within the cytoplasm. The extracellular domain of these receptors is extensively N-linked glycosylated, and this modification provides protection against proteases often found in inflammatory sites. CD36 is the prototype class B type scavenger receptor and was initially identified as a receptor for thrombospondin (50). In this capacity, it modulates angiogenesis and cell-to-cell interactions. It is one of the most widely studied scavenger receptors and is involved in multiple aspects of macrophage biology, including migration and signaling and inflammatory processes such as foam cell formation. CD36 also plays an important role in the host immune response to fungi and bacteria and binds erythrocytes infected with the malaria parasite, Plasmodium falciparum (51), and it also functions as a facilitator of long-chain fatty acid uptake (52). It is expressed in many cell types, including insulin-responsive cells, hematopoietic cells such as platelets, monocytes, and macrophages, endothelial cells, and specialized epithelial cells in the breast and eye. Endemann et al. (31) were the first to characterize CD36 as a receptor for OxLDL, thereby cementing its role as a scavenger receptor. CD36 also binds polyanionic ligands of both mammalian hosts (e.g., high-density lipoprotein [HDL]) (53) and pathogens (e.g., Staphylococcus aureus and Candida albicans) (20, 54), and plays an important role in the recognition and endocytic uptake of oxidized phospholipids, apoptotic cells, and amyloid proteins (20). Stewart and colleagues (55) have shown that CD36 (proposed name SR-B2) cooperates with TLR family members (TLR4 and TLR6) to activate the innate immune response to ligands that accumulate in Alzheimer’s disease and atherosclerosis, inducing proinflammatory mediators such as IL-1β and RANTES. SR-B1 (also known as SCARB1, SR-BI, or CD36L1) was initially cloned as a modified LDLR that could also bind unmodified LDL (56) and, together with CD36 (SR-B2), was the first surface receptor shown to bind anionic phospholipids (57). It was subsequently shown to be the first HDL receptor to be identified and to mediate the selective transport of lipids, such as cholesteryl esters from HDL, from circulating lipoproteins into cells (58, 59). SR-B1 is most highly expressed by hepatocytes and steroidogenic cells, but is also found in cells within the arterial wall and macrophages, such as those in human and murine atherosclerotic lesions (60). SR-B1 has been shown to have a protective effect on atherosclerosis development; total body ablation of SR-B1 in apoE-knockout mice fed a normal chow diet led to severe coronary arterial atherosclerosis, myocardial infarction, and death (61). Ablation of SR-B1 in bone marrow cells of LDLR knockout mice also resulted in increased atherosclerosis, but not death, indicative of partial protection against atherosclerosis (62). SR-B2, an alternatively spliced form of SR-B1 expressed at substantially lower levels than SR-B1, contains a distinctly different cytoplasmic tail from SR-B1. SR-B2 is expressed in adrenal glands, testes, and liver, and has been shown to mediate selective uptake of cholesteryl ester from HDL with ∼4-fold lower efficiency than SR-B1 (63). SR-B1. The protein is currently also known as SR-BI or CD36L1; the gene name is SCARB1. SR-B1.1. This is an alternatively spliced form of SR-B1, currently known as SR-BII. SR-B2. The protein is currently known as CD36, SCARB3, or PAS4 [prototype]. Class C scavenger receptors have been described in Drosophila (5), but there are currently no known mammalian class C scavenger receptors. This scavenger receptor class was not discussed because the workshop focused on mammalian scavenger receptors. Class D scavenger receptors: SR-D.
CD68 is the only member of the class D scavenger receptors. CD68, also known as macrosialin in mouse and by other names in mice and humans (Tables II, III), is a type I transmembrane glycoprotein that belongs to the lysosome-associated membrane protein (or LAMP) family of molecules (64). There is a 300 aa extracellular domain that is rich in threonine and serine, which may serve as attachment sites for carbohydrates. It has a short cytoplasmic tail. Human CD68 shares 75% aa sequence identity with mouse CD68 in the extracellular domain. CD68 is found on monocytes and tissue-specific macrophages in the peritoneum, lungs, liver, spleen, Langerhans cells, and microglia, and serves as a scavenger receptor for OxLDL (65). CD68 is a differentiation marker of hematopoietic cells of the monocyte/macrophage lineage. It is mostly found in the late endosomal compartment in macrophages and dendritic cells, with limited expression on resting cells. CD68 plays a minor role in the binding and uptake of oxidized lipoproteins and apoptotic cells by macrophages (23). SR-D1. The protein is currently known as CD68 [prototype]; the gene name is CD68 molecule. Class E scavenger receptors: SR-E.
Class E scavenger receptors are type 2 transmembrane proteins with C-type lectin-like domains and demonstrated scavenger receptor activity; sequence homology alone is not sufficient to include a protein in this class of receptors. Based upon their structure, these proteins belong to a subfamily of the NK cell C-type lectin-like (CLEC) receptor family. The NK receptor gene complex encodes a large number of CLEC-like receptors that are expressed on NK cells and other leukocytes. Analysis of the NK receptor gene complex in five species revealed variations in the sizes of the gene clusters: human (29 genes), dog (22 genes), cattle (32 genes), rat (75 genes), and mouse (57 genes) (66). Among these gene clusters, the first two members of the CLEC family, LOX-1 and dectin-1, have been well characterized and shown to have scavenger activity. Lectin-like oxidized LDLR (LOX-1) is expressed on macrophages and dendritic cells, and binds oxidized LDL and the acute phase protein C-reactive protein (or CRP) (67). It was originally cloned from a bovine aortic endothelial cDNA expression library screened for receptors for oxidized LDL (68). LOX-1 is expressed on vascular endothelial cells, platelets, smooth muscle cells, adipocytes, and macrophages. In addition to binding oxidized LDL, LOX-1 has been implicated in recognizing other ligands, including apoptotic cells, and Gram-positive and Gram-negative bacteria (23, 67). A splicing variant of human LOX-1 lacking a lectin-like domain, called LOXIN, can act as a dominant negative isoform forming a heterodimeric complex with LOX-1 (69). There are no data that this splicing variant is present in mouse cells. Dectin-1 is expressed predominantly on myeloid cells (macrophages, dendritic cells, and neutrophils), and can be regulated by cytokines and microbial stimuli. Human dectin-1 is alternatively spliced, resulting in two functional forms. This receptor recognizes various bacterial, fungal, and plant carbohydrates (β-1,3 and/or β1-6 glucans) in addition to intact fungi and parasites (70). Dectin-1 mediates proinflammatory cytokine production in response to β-glucan particles, in conjunction with TLR2. It can also function as a phagocytic receptor through both Syk-dependent and Syk-independent pathways (71). Dectin-1 has been reported to act as a costimulatory molecule to activate both CD4 and CD8 T cells. Moreover, dectin-1 is expressed on macrophages and dendritic cells in the medullary regions of the thymus, suggesting a role in thymocyte development (72). Some CLEC family members are known to recognize pathogen-associated molecules. However, most of the members of the CLEC family have not been shown to have scavenger receptor activity. At this time, only LOX-1 and dectin-1 can be classified as scavenger receptors using the definition proposed by the workshop participants. The human mannose receptor, CD206 (SR-E3), is a 175 kDa transmembrane glycoprotein characterized by eight C-type lectin carbohydrate recognition domains. Depending on the particle size and the cell type expressing the receptor, it may be involved in phagocytosis of mannose-coated particles, in endocytosis of mannosylated glycoproteins, or in receptor-mediated facilitated Ag presentation. Multiple roles of SR-E3 have been observed. As a pattern recognition receptor, SR-E3 recognizes glycans on the surface of pathogenic microorganisms, internalizes them via phagocytosis, and transports them to lysosomes for degradation. Cells isolated from skin, bone marrow, thymus, lymph node, and peripheral blood have demonstrated that SR-E3 is a differentiation marker of immature monocyte-derived dendritic cells. Studies have shown that inflammatory dendritic epidermal cells that are found in inflammatory skin diseases such as atopic dermatitis express the mannose receptor, SR-E3. These results suggest that SR-E3 expression in the epidermis may play an important role in capturing mannosylated Ags for subsequent Ag presentation (73). Other studies have shown that mannose receptors may also play a role in regulating the levels of molecules such as myeloperoxidase that are released in response to invading pathogenic microorganisms. SR-E3 may then remove these glycoproteins from the circulation to prevent damage to host tissues. The asialoglycoprotein receptor (ASGPR), also termed the hepatic binding protein or the Ashwell receptor, was discovered over four decades ago as a hepatocellular surface receptor that binds glycoproteins lacking terminal sialic acid residues (asialoglycoproteins) (74, 75). Subsequently, many studies have led to the detailed characterization of the ASGPR, describing its functional role in the binding, internalization and transport of a wide range of glycoproteins that have galactose or N-acetylgalactosamine residues via the process of receptor-mediated endocytosis (75–78). More specifically, it has been demonstrated that the ASGPR can bind a variety of clinically important plasma proteins that include transferrin (79), Igs including IgA (80), apoptotic cells (81), fibronectin (82, 83), enzymes such as alkaline phosphatase (84, 85), and immune cells (86, 87). The role of ASGPRs as a major liver clearance/scavenger mechanism in disease states remains a topic of current research efforts. Several laboratories have investigated the relationship between altered ASGPR function and specific mechanisms involved in the pathogenesis of liver disease. Studies examining translatable consequences of altered hepatic clearance/scavenging mechanisms revealed that liver damaging mechanisms such as aberrant apoptotic cell regulation and innate immune defenses were associated with impaired ASGPR function. Particularly, it was shown that ethanol-mediated impairments in ASGPR clearance of apoptotic cells could be related to enhancements of proinflammatory mechanisms during liver disease (88, 89). Additionally, it was found that ethanol-mediated alterations to ASGPRs led to defective hepatocyte killing of T cells, which could impact liver immunologic homeostasis and be related to the accumulation of lymphocytes, especially CD8+ T cells, that occurs during alcoholic hepatitis (90, 91). And more recently, it was determined that impaired ASGPR function due to alcohol resulted in altered uptake and trafficking of alkaline phosphatases, leading to defective detoxification of LPS and enhanced inflammatory liver injury (92, 93). These findings indicate that proper functioning of the ASGPR may mediate universal protective mechanisms against liver injury by removing a range of desialylated proteins from the circulation (94), demonstrating the physiological importance of this hepatic scavenging receptor system. Moreover, it is clear that there is an association between altered ASGPR function and the progression of liver disease. Further characterization of ASGPR’s contribution in liver disease mechanisms could bring forth a better understanding and the potential development of successful therapeutic options for liver disease patients. SR-E1. The protein is currently known as LOX-1; the gene name is OLR1: oxidized LDLR 1. SR-E1.1. An alternatively spliced form of SR-E1, the protein is known as LOXIN (no known scavenger receptor activity but works as a dominant negative form). SR-E2. The protein is currently known as dectin-1; the gene name is CLEC7A. SR-E3. The protein is currently known as mannose receptor 1, CD206, or MRC1; the gene name is mannose receptor C type 1. SR-E4. The protein is currently known as ASGPR1, CLEC4H1, or HL-1; the gene name is ASGR1. Class F scavenger receptors: SR-F. There are currently three members belonging to the class F scavenger receptors. The first class F scavenger receptor (SCARF or SCARF1) was identified as an endothelial receptor for modified LDL, and is characterized by the presence of an extracellular ligand-binding domain, with multiple extracellular epidermal growth factor–like repeats, a transmembrane domain, and a long cytoplasmic tail that includes a serine/proline-rich region followed by a glycine-rich region and is rich in positively charged residues (38). It was named scavenger receptor expressed by endothelial cells (SREC or SREC-I) (95). SCARF1/SREC-I is also expressed in macrophages, and functions to bind calreticulin and associated peptides, which are transported into the MHC class I pathway in macrophages and dendritic cells (23). SCARF1 is also a receptor for fungal pathogens and heat shock proteins (20, 38). Interestingly, a Caenorhabditis elegans ortholog of SCARF1, CED-1, plays a role in engulfing apoptotic cells and has been implicated in host defense (23). A recent report indicates that SCARF1, similar to CED-1, participates in the clearance of apoptotic cells (96). SREC-II, also known as SCARF2, was isolated by Ishii et al. (97) in 2002. Although SREC-II, like SREC-I, was initially identified on endothelial cells, SREC-II is also expressed on macrophages. SREC-II can bind to SREC-I in trans (97), but a scavenger receptor function for SREC-II has not yet been reported. Another member of the SCARF family, multiple EGF-like domains-10 (MEGF10), recently has been shown to be a receptor for the protein amyloid-β in the brain, and is thought to be involved in the pathogenesis of Alzheimer’s disease (23). Recently, MEGF10 has been shown to be a receptor for the complement protein C1Q and consequently to mediate the clearance of apoptotic cells in the developing mouse cerebellum (98). Mutations in MEGF10 in humans result in early-onset myopathy, areflexia, respiratory distress, and dysphagia (EMARDD). These EMARDD mutations also have a defect in binding C1Q (98). Whether such a defect is related to the clinical presentation of EMARDD patients is not known. It is not clear yet whether other MEGF family members, such as MEGF8, 9, and 11, also have a scavenger receptor function, because no functional studies have been published to date on these molecules. SR-F1. The protein is currently known as SREC-I/SCARF1 [prototype]; the gene name is SCARF1. SR-F2. The protein is currently known as MEGF10. Class G scavenger receptors: SR-G. Currently, one receptor belongs to scavenger receptor class G, SR-PSOX/CXCL16. Shimaoka et al. (99) used expression cloning from a cDNA library of PMA-treated human monocytic THP-1 cells to identify scavenger receptors that bound OxLDL, and discovered this receptor, which they called SR-PSOX (scavenger receptor that binds phosphatidylserine and oxidized lipids). At around the same time, the groups of Dr. Jason Cyster and Dr. Michael Briskin discovered a new chemokine that was capable of activating CXCR6 (also known as BONZO, STRL33, or TYMSTR), resulting in migration of T cells in vitro (100–102). This chemokine was named CXCL16 and was found to be identical to SR-PSOX in its amino acid sequence. Studies show that the SR-PSOX/CXCL16 gene is located on chromosome 17p13, and its protein exists in both membrane and soluble forms (100). It is a type I transmembrane glycoprotein with a CXC chemokine motif, mucin stalk, transmembrane, and extracellular/soluble domains. SR-PSOX/CXCL16 does not share structural similarity with other scavenger receptors. SR-PSOX/CXCL16 has the capacity to mediate adhesion and phagocytosis of bacteria by APCs (101). The membrane-bound form can function as an adhesion molecule for CXCR6-expressing T cells without requiring CXCR6-induced signal transduction and integrin activation. This multifunctional transmembrane protein has a chemokine-like CXC motif and appears to be involved in several phases of an immune response from Ag recognition to migration of immune cells to formation of inflammatory foci (103). The soluble form of SR-PSOX/CXCL16, produced by cleavage from the membrane domain, functions as a chemoattractant for activated T cells and bone marrow plasma cells via its receptor CXCR6 (104). The membrane-bound form acts as a scavenger receptor for OxLDL, and facilitates phagocytosis of bacteria by APCs (104). SR-G1. The protein is currently known as SR-PSOX/CXCL16 [prototype]; the gene name is CXCL16. Class H scavenger receptors: SR-H.
Receptors in this class are transmembrane proteins that consist of fasciclin, EGF-like, and lamin-type EGF-like (FEEL) domains. The currently known proposed SR-H group members are FEEL-1/stabilin-1/CLEVER-1, and FEEL-2/stabilin-2/HARE. FEEL-1 is predominantly expressed in macrophages, mononuclear cells, hematopoietic stem cells, and endothelial cells, whereas FEEL-2 is found mainly in sinusoidal endothelial cells. FEEL-1 and FEEL-2 have been shown to be involved in lymphocyte adhesion, transmigration, angiogenesis, apoptotic cell clearance, and intracellular trafficking. FEEL-1 and FEEL-2 also have been implicated in the clearance of aged RBCs by macrophages (105, 106) in a phosphatidylserine-dependent manner. FEEL-1 has been shown to directly interact with and phagocytose phosphatidylserine-coated beads, but this action has yet to be confirmed in vivo. However, FEEL-1 and FEEL-2 double knockout mice have been shown to have impairment in the clearance of noxious blood factors (107). SR-H1. The protein is currently known as FEEL-1, stabilin-1, or CLEVER-1 [prototype]; the gene name is STAB1. SR-H2. The protein is currently known as FEEL-2, or stabilin-2; the gene name is STAB2. Class I scavenger receptors: SR-I. The CD163 family of molecules are type I transmembrane receptors characterized by multiple group B SRCR domains in their extracellular domain, with membrane proximal SRCR domains in a conserved b-c-d-e-d′ cassette organization. The structure of each SRCR domain, modeled on the CD5 group B SRCR domain crystal structure (108), offers potential binding sites on aqueous-accessible loops, β strands, an α helix, and in a hydrophobic cavity. CD163A, the prototypic proposed class I scavenger receptor, is expressed exclusively by monocytes and macrophages and binds to haptoglobin-hemoglobin complexes to promote the clearance of plasma hemoglobin via endocytosis during intravascular hemolysis. CD163A is a type I transmembrane protein consisting of an extracellular domain composed of nine SRCR domains and a short cytoplasmic tail. CD163A was originally cloned from the spleen of a patient afflicted with hairy cell leukemia, characterized by a large number of tissue macrophages. It is a 130 kDa membrane glycoprotein, and was known as M130 prior to being given a CD designation. CD163A was also given a functional name, “hemoglobin scavenger receptor” to describe its primary role in tissue macrophages (109). Its role as a hemoglobin receptor may contribute to enhancement of an anti-inflammatory response because the proinflammatory heme is converted to anti-inflammatory metabolites (110). In addition to functioning as an hemoglobin receptor, CD163A binds Gram-negative and Gram-positive bacteria via an outside loop (111). It appears to be involved in intracellular signaling via protein kinases, causing secretion of cytokines such as IL-6 and IL-10 (112). Several CD163A mRNAs arising from alternatively spliced CD163 gene transcripts have been reported (109, 112). Confocal microscopy studies revealed that the variant with the shortest tail is predominantly present in the cell membrane, whereas the variants with the longer tails are located in the endosomal/Golgi cellular compartment (112). One short tail variant and two long tail variants have been shown to bind and internalize haptoglobin-hemoglobin complexes leading to lysosomal degradation of the complex (112). The short tail variant is the predominant isoform found in human blood, liver, and spleen, whereas the majority of the long tail variants appear in endosomal compartments (112). CD163-L1 (M160, CD163B, encoded by CD163L1), a long tail homolog of CD163A, is a type I transmembrane molecule structurally composed of 12 SRCR domains, expressed by cells of the myeloid lineage, and may be involved in the differentiation of monocytes to macrophages. Thus far, it has only been found in the human and equine genomes (113). Two cytoplasmic splice variants of CD163-L1 have been identified thus far: the full-length variant (CD163-L1α) with a cytoplasmic tail of 71 aa residues and the short tail variant (CD163-L1β) with 39 aa residues. CD163-L1α is the predominant membrane-associated form in several human tissues such as spleen, placenta, and small intestine, whereas CD163-L1β is mainly found in intracellular compartments (114). Studies to identify endogenous and microbial ligands of CD163-L1β are currently in progress. The third human CD163 family molecule is CD163c-α (CD163-L1 or hSCART1). It is a type I transmembrane molecule characterized by an extracellular domain with five SRCR domains, a transmembrane domain, and a cytoplasmic domain containing tyrosine and serine phosphorylation motifs as well as a dileucine endocytic motif. Alternatively spliced isoforms include one with two SRCR domains, a transmembrane and cytoplasmic domain, and one with four SRCR domains that are predicted to be secreted. It is expressed by αβ and γδ T cells and in the small intestine and colon (115). The murine genome encodes two CD163c-α genes, SCART1 and SCART2, which are expressed on γδ T cells, and in the lymph node, trachea, and lung. The bovine genome contains one CD163 gene and one CD163c-α/SCART1 gene, which are both expressed in γδ T cells, as well as peripheral blood monocytes, mesenteric lymph node, lung, and intestinal epithelial lymphocytes (113). In addition to the class I scavenger receptors expressed in humans (CD163A, CD163b, and CD163c-α/SCART1), other mammalian species also express a closely related molecule WC1 (T19) (113). In species examined thus far, WC1 is encoded in duplicated multigenic arrays. The bovine genome has 13 WC1 genes (116, 117). Twelve of the bovine WC1 genes encode 11 SRCR domains; one encodes six SRCR domains in the extracellular domain. All WC1 molecules are type I transmembrane receptors with a signal peptide, SRCR domains in the extracellular domain organized into the b-c-d-e-d′ cassette that has been conserved in the CD163 family, a transmembrane domain, and a cytoplasmic domain (117, 118). Table IV provides the nomenclature for the bovine scavenger receptors. In the bovine, WC1 is only expressed on γδ T cells where it serves as a hybrid coreceptor and pattern recognition receptor in the γδ T cell memory response to bacteria (119–121). Coreceptor signaling through WC1 and TCR is dependent on the phosphorylation of tyrosines and serines in the WC1 cytoplasmic domain, and is downregulated by endocytosis via a WC1 dileucine motif (119–121). Individual WC1 SRCR domains from selected WC1 molecules bind to the bacteria Leptospira spp., Borrelia burgdorferi, and Mycobacteria spp., suggesting that the natural selection pressure necessary to maintain multiple WC1 open reading frames is derived from the specificity for diverse pathogens of individual WC1 molecules (122). Of note, WC1 receptors are not the only scavenger receptors expressed in bovine tissues. As mentioned earlier, SR-A, SR-E, and SR-J were initially cloned from bovine lung and endothelial cells, respectively. Table IV refers only to scavenger receptors exclusively described in bovine tissues. The proposed definition for this group is transmembrane proteins with multiple SRCR domains. SR-I1. The protein is currently known as CD163A or M130 [prototype]; the gene name is CD163. SR-I1.1. The protein is the CD163 long tail variant 1. SR-I1.2. The protein is the CD163 long tail variant 2. SR-I2. The protein is currently known as CD163B or M160; the gene name is CD163L1. SR-I3. The protein is currently known as CD163c-α or SCART1; the gene name is cd163l1. SR-I4. The protein is currently known as murine SCART2. SR-I5 to SR-I17. The proteins currently correspond to bovine WC1-1 to WC1-13. Class J scavenger receptors: SR-J. The receptor for advanced glycation end products (RAGE) is currently the only member of the class J scavenger receptor group. It is a member of the Ig superfamily of cell surface molecules capable of interacting with a broad spectrum of ligands, including advanced glycation end products, high mobility group protein box-1 (HMGB1), and the S-100 protein. RAGE is composed of a single transmembrane domain that connects the amino-terminal ligand recognition and binding ectodomain with a short cytoplasmic domain. The extracellular domain also contains three Ig-like regions. RAGE is a pattern recognition receptor predominantly involved in the recognition of endogenous molecules released in the context of infection, physiological stress, or chronic inflammation (123). Signaling through RAGE mediates processes such as inflammation, oxidative stress, and apoptosis, which can lead to pathologies including atherosclerosis, diabetes, cancer, neurodegenerative disease, and stroke (124). RAGE signaling also mediates developmental processes in neurons such as cell migration and differentiation. However, studies assessing brain pathology in Alzheimer’s disease revealed that diseased brains express higher levels of RAGE in the vasculature and on neurons compared with normal brains (23). In addition to the membrane-bound form, a circulating portion of the protein, known as “soluble” RAGE (termed sRAGE) also has biological properties. Elevated levels of soluble RAGE and HMGB1 expression were observed in patients with myocarditis compared with healthy controls (125). Moreover, RAGE-deficient mice were observed to be protected from developing troponin I–induced autoimmune myocarditis, with a concomitant decrease in several inflammatory mediators (126). SR-J1. The protein is currently known as the membrane-bound form of RAGE/AGER; the gene name is AGER. SR-J1.1. This terminology will be used to designate the soluble form of RAGE. Class K scavenger receptors: SR-K.
Several lines of evidence suggest that CD44, a cell surface glycoprotein best known as a receptor for hyaluronan, should be included within the family of scavenger receptors. Although CD44 is not structurally homologous to any of the known scavenger receptors, it nonetheless shares structural features in common with them. It is a multidomain, single-span transmembrane protein with only a modest cytosolic tail with limited direct signaling capabilities (127). The N-terminal extracellular domain consists of motifs that serve as docking sites for various ligands that include hyaluronan, extracellular matrix glycoproteins and proteoglycans, growth factors, cytokines, and matrix metalloproteinases. The C-terminal cytoplasmic tail binds to cytoskeletal elements and interacts with signaling molecules, which are members of the Src family kinases (128). Like other scavenger receptors, it is susceptible to shedding by exofacial proteases (129) and these cleavage products are thought to be biologically active (130). CD44 also has functional properties in common with other scavenger receptors. It has a broad repertoire of ligands that include both host (131–133) and microbial (134) molecules. It associates with a diverse range of other proteins, including TGF-βRI (135), CD3 (136), TLR 2 (137), and CD14 (138), and thereby engages with multiple intracellular signaling pathways, probably through formation of heteromultimeric signaling complexes and interactions with the actin cytoskeleton (139). Like other scavenger receptors, it contributes to the clearance of its extracellular matrix ligands via endocytosis (140). CD44 also contributes to pattern recognition (141) and innate immunity (142). As with other scavenger receptors, the pro- and anti-inflammatory contributions of CD44 are highly dependent on cell type and context (143–145) Along with its immunologic roles, CD44 also makes important, overlapping contributions to cellular migration (146), polarization (147), and homeostasis (148). In light of these structural and functional similarities with other scavenger receptors, we have included CD44 as a distinct class of scavenger receptor, class M.
SR-K1. The protein is currently known as CD44; the gene name is CD44. Class L scavenger receptors: SR-L.
SR-L1 is one of the largest members of the LDLR gene family (149). It is also known as LDLR-related protein 1 (LRP1), α2-macroglobulin receptor (A2MR), or CD91 (150). The gene family to which SR-L1 belongs includes as its best known member the LDLR, which serves as the principal clearance receptor for plasma cholesterol. The first members of this ancient family likely appeared with the first metazoans, as they are present in the most primitive multicellular eukaryotic organism that survives on the planet to this day. Remarkably, despite being separated from present day mammals by ∼1 billion years of evolution, their exon/intron structure has been conserved virtually perfectly throughout time. Moreover, within the mammalian kingdom, SR-L1 in particular exhibits a remarkable degree of primary amino acid sequence conservation, which further emphasizes the unique importance of SR-L1, and several other members of the gene family, that is, LRP1b, LRP2, LRP4, LRP8, and very LDLR (termed VLDLR) for the survival of all species (151). LRP2 is involved in the reuptake of albumin, vitamin D–binding protein, and retinol-binding protein. LRP2 is defective in Donnai–Barrow syndrome (152). Although LRP1/SR-L1 and other family members have been investigated intensely for a quarter century, we still do not have a complete understanding of all their biological functions. Rather than transmitting an extracellular signal across the membrane itself, SR-L1 mostly regulates such signals by serving as an extracellular sensor that detects the presence of a myriad of cargo ligands or bioactive molecules in the extracellular space. By modifying or integrating signals transmitted through classical signal transducing receptors SR-L1 serves a double purpose: it clears and removes—or scavenges—the ligands from the surface or extracellular space and, at the same time, the presence of these ligands modifies the signals sent to the interior of the cell by the associated classical signal transduction receptors. In this way, the cell can receive a variety of signals, which include, for instance, the activity of extracellular protease activity, cellular adhesion, nutrient availability, and growth signals, and which help the cell to determine its status within the tissue and the organism as a whole. Hence, serving as an extracellular sensor and simultaneously as a scavenger receptor for the same ligands are merely two faces of the same coin. Currently, over 100 functionally diverse ligands are known to interact with LRP1/SR-L1. Many of them have also been found to bind to LRP1b and to LRP2, both closely related family members of similar size, but different tissue distribution. For most of these ligands, the exact biological conditions that are regulated by their receptor interactions, and in particular the coreceptors or signal transducers whose functions they modulate, remain unknown. Only some of these functions are briefly listed here and they include limb and brain development, synaptic homeostasis and amyloid clearance and removal (153), liver lipid and energy metabolism, synaptic transmission, thrombosis, hemostasis, the protection of vascular integrity by regulating reverse cholesterol transport, fibrosis and smooth muscle cell proliferation (154), regulation of the inflammatory response (e.g., through TLRs and defensins), and others (155). Megalin (SR-L2), also known as LRP2, is a multiligand endocytic receptor that belongs to the LRP family of proteins. It is a large membrane glycoprotein that belongs in the LDLR family. It is expressed on the apical membrane of several epithelial cells such as kidney proximal tubule cells, lung, thyroid, gallbladder, and neuroepithelium, as well as steroid-responsive tissues such as epididymis, prostate, ovaries, and uterus (156, 157). The cytoplasmic domain is small and has been suggested to regulate its endocytic activities (158). SR-L2 is expressed at the blood brain barrier where it binds and internalizes a variety of ligands such as leptin, insulin, and amyloid β peptide (157). Mice that lacked megalin/SR-L2 in brain endothelial cells exhibited neurodegeneration and neuroinflammation, as well as obesity (157). Evidence has also been demonstrated for the role of peroxisome proliferator-activated receptors (termed PPARs) in regulating the expression of SR-L2 (158). SR-L1. The protein is currently known as LDLR-related protein 1 (LRP1). It is also known as α2-macroglobulin receptor (A2MR), apolipoprotein E receptor (APOER) or CD91; the gene name is Lrp1. SR-L2. The protein is currently known as megalin or gp330; the gene name is Lrp2. 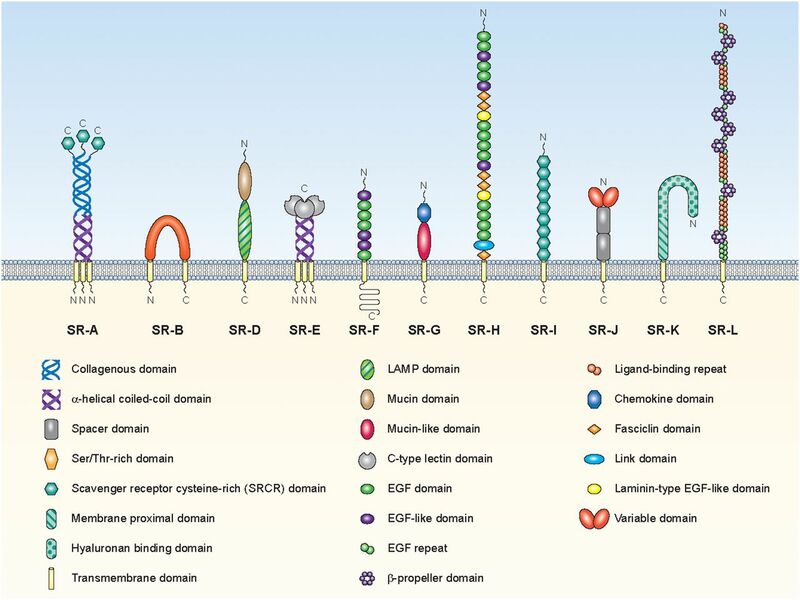 Other potential scavenger receptors: SR-Others. The SR-Others group refers to molecules with scavenger activity that do not belong to the current scavenger receptor classes, but belong to other receptor families. These receptors include CD11b/CD18 α. Classifying these receptors as scavenger receptors will require the input of the wider scientific community. Another receptor that may be considered for inclusion as a scavenger receptor is CD14. CD14 is a GPI-linked protein found on monocytes and polymorphonuclear leukocytes. CD14 has a binding site for amphipathic molecules such as LPS and lipidated microbial cell wall fragments, as well as phosphatidylcholine, phosphatidylinositol, and other endogenous phospholipids. Binding of amphiphiles to CD14 is readily reversible, allowing cell surface CD14 to transfer the amphiphiles into the plasma membrane bilayer, to MD2 or to TLR4. By this means, CD14 can serve as a shuttle for the clearance of amphiphilic molecules. Shuttling of bacterial LPS is particularly favored because the plasma protein, LPS-binding protein, serves as a lipid transfer protein that specifically transfers LPS monomers into CD14. The binding of LPS to CD14 catalyzed by the LPS-binding protein can then be followed by transfer of the LPS to MD2 or TLR4 or into the plasma membrane bilayer. CD14 thereby fulfills the definition of scavenger receptor by binding multiple ligands and serving for their clearance. CD14 may be shed from the surface and appears in plasma and other biological fluids at relatively high levels. This soluble CD14 retains the ability to bind amphiphiles and retains the ability to serve in the shuttling of lipids. The decision to exclude specific receptors for viruses which facilitate entry of viral particles into cells is based on their inability to meet most of the criteria of scavenger receptors. Three examples of such receptors are angiotensin-converting enzyme-2 (ACE2), aminopeptidase N, which is also known as CD13, and lysosomal integral membrane protein 2 (also known as SCARB2 or CD36b like-2). ACE2 is a type I membrane-bound zinc metallopeptidase. It functions as a monocarboxypeptidase that cleaves the C-terminal amino acid from angiotensins I and II as well as from several other peptides at its extracellular catalytic domain (159). It is also the receptor for the SARS coronavirus (160). Although its peptidase activity is not specific to a single peptide substrate or peptide sequence, its function is to metabolize self rather than altered-self peptides. In its role as a virus receptor, the only ligand that is reported to bind to ACE2 with high affinity is the S1 domain of the SARS virus (160), suggestive of a high specificity, as opposed to broad-ligand specificity. Additionally, ACE2 enables the SARS virus to enter cells simply by serving in a passive role as an anchor to the cell membrane, allowing it to fuse with and penetrate the cell membrane to enter cells. Moreover, this internalization allows the virus to proliferate rather than to be eliminated or inactivated as would occur with a scavenger receptor. Aminopeptidase N (CD13, E.C. 3.4.11.2) is a type I membrane-bound zinc metallopeptidase that cleaves the amino terminal from angiotensin III, enkephalins, and several other peptides at its extracellular catalytic domain (161). It is also the receptor for several coronaviruses: 229E, transmissible gastroenteritis virus, porcine epidemic diarrhea virus, and feline infectious peritonitis virus, which belong to the group I coronaviruses (160, 162). Similar to ACE2, its peptidase activity is not specific to a single peptide substrate or peptide sequence, and its function is to metabolize self rather than altered-self peptides. In its role as a virus receptor, it is still relatively selective, inasmuch as it binds a limited number of class I coronaviruses, in contrast to a broad-ligand specificity. Additionally, aminopeptidase N enables the viruses to enter cells also serving a passive role as an anchor to the cell membrane that allows the viruses to fuse with and penetrate the cell membrane to enter cells. As noted above, this internalization allows the virus to proliferate rather than to be inactivated, as would occur with a scavenger receptor. Lysosomal integral membrane protein 2 (LIMP2, also known as SCARB2 or CD36b like-2) is a member of the CD36 superfamily of proteins and is a type III glycoprotein located in the membranes of lysosomes and endosomes and contains two transmembrane domains (163). Some of its functions include transporting the lysosomal protein glucocerebrosidase from the endoplasmic reticulum through the Golgi system to lysosomes where cellular degradation occurs (164). Reports have demonstrated that LIMP2 is a receptor for a variety of human enteroviruses such as EV71, coxsackievirus (CV) A16, CVA14, and CVA7 (165), supporting viral propagation and cytopathic effects. It is not known if LIMP2 has additional scavenger receptor like functions. Classifying LIMP2 as a potential scavenger receptor will be reassessed if additional information becomes available. In addition to their functions as phagocytic receptors and innate immune recognition receptors, scavenger receptors also play an important role as regulators of inflammatory signaling. A schematic representation of the current scavenger receptors classes is provided in Fig. 2. These receptors have also been implicated in a number of physiological and pathological processes. These include interactions with other innate immune receptors, delivery of ligands to different cellular compartments, and Ag presentation. Furthermore, the role of these receptors in neurodegenerative diseases, diabetes, and other metabolic disorders, and their potential as targets for therapeutic interventions to treat various disorders, warrant further study. Having a standardized nomenclature as described herein will help to overcome current ambiguities in communication about specific scavenger receptors and, perhaps, remove a major barrier for researchers in other fields to enter the scavenger receptor field. Schematic representation of different classes of scavenger receptors. Mammalian scavenger receptors are divided into 12 classes. The various protein or carbohydrate domains are identified in the key within the figure. Class C is not represented here because it is present only in Drosophila melanogaster. We thank Ethan Tyler from the National Institutes of Health Medical Arts for assistance with Fig. 2.
scavenger receptor expressed by endothelial cells.
. 1983. Lipoprotein metabolism in the macrophage: implications for cholesterol deposition in atherosclerosis. Annu. Rev. Biochem. 52: 223–261.
. 1983. cDNA cloning of the bovine low density lipoprotein receptor: feedback regulation of a receptor mRNA. Proc. Natl. Acad. Sci. USA 80: 7501–7505.
. 1984. Expression and regulation of human low-density lipoprotein receptors in Chinese hamster ovary cells. Nature 307: 742–745. 1997. The other side of scavenger receptors: pattern recognition for host defense. Curr. Opin. Lipidol. 8: 275–280.
. 2011. P2X(7) is a scavenger receptor for apoptotic cells in the absence of its ligand, extracellular ATP. J. Immunol. 187: 2365–2375.
. 2004. Type F scavenger receptor SREC-I interacts with advillin, a member of the gelsolin/villin family, and induces neurite-like outgrowth. J. Biol. Chem. 279: 40084–40090.
. 2000. Proposed standard nomenclature for new tumor necrosis factor members involved in the regulation of bone resorption. Bone 27: 761–764.
. 2013. International Union of Pharmacology. LXXXVII. Complement peptide C5a, C4a, and C3a receptors. [Published erratum appears in 2014 Pharmacol. Rev. 66: 466.] Pharmacol. Rev. 65: 500–543. 2009. The history of the pharmacology and cloning of ionotropic glutamate receptors and the development of idiosyncratic nomenclature. Neuropharmacology 56: 6–21.
. 1980. The scavenger cell pathway for lipoprotein degradation: specificity of the binding site that mediates the uptake of negatively-charged LDL by macrophages. J. Supramol. Struct. 13: 67–81.
. 1981. Factors regulating the activities of the low density lipoprotein receptor and the scavenger receptor on human monocyte-macrophages. J. Lipid Res. 22: 1131–1141.
. 1988. Purification and characterization of a bovine acetyl low density lipoprotein receptor. Proc. Natl. Acad. Sci. USA 85: 9238–9242.
. 1990. Type I macrophage scavenger receptor contains α-helical and collagen-like coiled coils. Nature 343: 531–535.
. 1990. Coiled-coil fibrous domains mediate ligand binding by macrophage scavenger receptor type II. Nature 343: 570–572.
. 1994. The type I macrophage scavenger receptor binds to gram-positive bacteria and recognizes lipoteichoic acid. Proc. Natl. Acad. Sci. USA 91: 1863–1867.
. 1993. Molecular flypaper, host defense, and atherosclerosis. Structure, binding properties, and functions of macrophage scavenger receptors. J. Biol. Chem. 268: 4569–4572.
. 1996. Scavenger receptor-mediated adhesion of microglia to beta-amyloid fibrils. Nature 382: 716–719.
. 2009. Evolutionarily conserved recognition and innate immunity to fungal pathogens by the scavenger receptors SCARF1 and CD36. J. Exp. Med. 206: 637–653.
. 2013. Scavenger receptors in homeostasis and immunity. Nat. Rev. Immunol. 13: 621–634. 2002. Pattern recognition receptors: doubling up for the innate immune response. Cell 111: 927–930.
. 2012. Microglial scavenger receptors and their roles in the pathogenesis of Alzheimer’s disease. Int. J. Alzheimers Dis. 2012: 489456.
. 1993. Divalent cation-independent macrophage adhesion inhibited by monoclonal antibody to murine scavenger receptor. Nature 364: 343–346.
. 1997. A role for macrophage scavenger receptors in atherosclerosis and susceptibility to infection. Nature 386: 292–296.
. 2006. Identification and characterization of murine SCARA5, a novel class A scavenger receptor that is expressed by populations of epithelial cells. J. Biol. Chem. 281: 11834–11845.
. 2010. Genetic and epigenetic silencing of SCARA5 may contribute to human hepatocellular carcinoma by activating FAK signaling. J. Clin. Invest. 120: 223–241.
. 1998. The mannose receptor is a pattern recognition receptor involved in host defense. Curr. Opin. Immunol. 10: 50–55.
. 1993. CD36 is a receptor for oxidized low density lipoprotein. J. Biol. Chem. 268: 11811–11816.
. 2014. Standardizing scavenger receptor nomenclature. J. Immunol. 192: 1997–2006.
. 1995. Murine macrophage scavenger receptor: in vivo expression and function as receptor for macrophage adhesion in lymphoid and non-lymphoid organs. Eur. J. Immunol. 25: 466–473.
. 2006. Expression of the class A macrophage scavenger receptor on specific subpopulations of murine dendritic cells limits their endotoxin response. Eur. J. Immunol. 36: 950–960.
. 2004. The scavenger receptor cysteine-rich (SRCR) domain: an ancient and highly conserved protein module of the innate immune system. Crit. Rev. Immunol. 24: 1–37.
. 1994. The SRCR superfamily: a family reminiscent of the Ig superfamily. Trends Biochem. Sci. 19: 5–8.
. 1999. Analysis of macrophage scavenger receptor (SR-A) expression in human aortic atherosclerotic lesions. Arterioscler. Thromb. Vasc. Biol. 19: 461–471.
. 2001. Molecular cloning and functional characterization of a human scavenger receptor with C-type lectin (SRCL), a novel member of a scavenger receptor family. Biochem. Biophys. Res. Commun. 280: 1028–1035.
. 2001. The membrane-type collectin CL-P1 is a scavenger receptor on vascular endothelial cells. J. Biol. Chem. 276: 44222–44228.
. 2010. Comparison of gene expression profiles between human and mouse monocyte subsets. Blood 115: e10–e19.
. 2013. Scara1 deficiency impairs clearance of soluble amyloid-β by mononuclear phagocytes and accelerates Alzheimer’s-like disease progression. Nat. Commun. 4: 2030.
. 1991. Recognition and plasma clearance of endotoxin by scavenger receptors. Nature 352: 342–344.
. 1993. The collagenous domains of macrophage scavenger receptors and complement component C1q mediate their similar, but not identical, binding specificities for polyanionic ligands. J. Biol. Chem. 268: 3530–3537.
. 2012. The evolution of the class A scavenger receptors. BMC Evol. Biol. 12: 227.
. 2008. Expression and tissue localization of collectin placenta 1 (CL-P1, SRCL) in human tissues. Mol. Immunol. 45: 3278–3288.
. 1999. Regulation and functional involvement of macrophage scavenger receptor MARCO in clearance of bacteria in vivo. J. Immunol. 162: 939–947.
. 1987. Isolation of the thrombospondin membrane receptor. J. Clin. Invest. 79: 1054–1061.
. 1988. Plasmodium falciparum sequestration: OKM5 antigen (CD36) mediates cytoadherence of parasitized erythrocytes to a myelomonocytic cell line. J. Infect. Dis. 157: 584–588.
. 2000. Defective uptake and utilization of long chain fatty acids in muscle and adipose tissues of CD36 knockout mice. J. Biol. Chem. 275: 32523–32529.
. 1998. The efficient cellular uptake of high density lipoprotein lipids via scavenger receptor class B type I requires not only receptor-mediated surface binding but also receptor-specific lipid transfer mediated by its extracellular domain. J. Biol. Chem. 273: 26338–26348.
. 2005. Response to Staphylococcus aureus requires CD36-mediated phagocytosis triggered by the COOH-terminal cytoplasmic domain. J. Cell Biol. 170: 477–485.
. 2010. CD36 ligands promote sterile inflammation through assembly of a Toll-like receptor 4 and 6 heterodimer. Nat. Immunol. 11: 155–161.
. 1994. Expression cloning of SR-BI, a CD36-related class B scavenger receptor. J. Biol. Chem. 269: 21003–21009.
. 1995. The class B scavenger receptors SR-BI and CD36 are receptors for anionic phospholipids. J. Biol. Chem. 270: 16221–16224.
. 1996. Identification of scavenger receptor SR-BI as a high density lipoprotein receptor. Science 271: 518–520. 1999. Charting the fate of the “good cholesterol”: identification and characterization of the high-density lipoprotein receptor SR-BI. Annu. Rev. Biochem. 68: 523–558.
. 2011. Scavenger receptors: implications in atherothrombotic disorders. Int. J. Biochem. Cell Biol. 43: 697–700.
. 2002. Loss of SR-BI expression leads to the early onset of occlusive atherosclerotic coronary artery disease, spontaneous myocardial infarctions, severe cardiac dysfunction, and premature death in apolipoprotein E-deficient mice. Circ. Res. 90: 270–276.
. 2003. Scavenger receptor class B type I-mediated protection against atherosclerosis in LDL receptor-negative mice involves its expression in bone marrow-derived cells. Arterioscler. Thromb. Vasc. Biol. 23: 1589–1594.
. 1998. SR-BII, an isoform of the scavenger receptor BI containing an alternate cytoplasmic tail, mediates lipid transfer between high density lipoprotein and cells. J. Biol. Chem. 273: 15241–15248.
. 2011. Deletion of the murine scavenger receptor CD68. J. Lipid Res. 52: 1542–1550.
. 1996. Cell surface expression of mouse macrosialin and human CD68 and their role as macrophage receptors for oxidized low density lipoprotein. Proc. Natl. Acad. Sci. USA 93: 14833–14838.
. 2006. Heterogeneous but conserved natural killer receptor gene complexes in four major orders of mammals. Proc. Natl. Acad. Sci. USA 103: 3192–3197.
. 2011. The discovery of LOX-1, its ligands and clinical significance. Cardiovasc. Drugs Ther. 25: 379–391.
. 1997. An endothelial receptor for oxidized low-density lipoprotein. Nature 386: 73–77.
. 2008. The splice variant LOXIN inhibits LOX-1 receptor function through hetero-oligomerization. J. Mol. Cell. Cardiol. 44: 561–570.
. 2004. The role of Dectin-1 in antifungal immunity. Crit. Rev. Immunol. 24: 193–203.
. 2011. The role of Dectin-1 in the host defence against fungal infections. Curr. Opin. Microbiol. 14: 392–399.
. 2004. Expression of the beta-glucan receptor, Dectin-1, on murine leukocytes in situ correlates with its function in pathogen recognition and reveals potential roles in leukocyte interactions. J. Leukoc. Biol. 76: 86–94.
. 2002. Expression and function of the mannose receptor CD206 on epidermal dendritic cells in inflammatory skin diseases. J. Invest. Dermatol. 118: 327–334.
. 1974. The role of surface carbohydrates in the hepatic recognition and transport of circulating glycoproteins. Adv. Enzymol. Relat. Areas Mol. Biol. 41: 99–128.
. 1981. Hepatic recognition and catabolism of serum glycoproteins. JAMA 246: 2358–2364. 1995. The asialoglycoprotein receptor: relationships between structure, function, and expression. Physiol. Rev. 75: 591–609. 1993. Endocytosis and function of the hepatic asialoglycoprotein receptor. Subcell. Biochem. 19: 125–161.
. 1987. Chronic ethanol administration impairs the binding and endocytosis of asialo-orosomucoid in isolated hepatocytes. J. Biol. Chem. 262: 2704–2710.
. 1982. Receptor-rich intracellular membrane vesicles transporting asialotransferrin and insulin in liver. Nature 298: 398–400.
. 1985. Carbohydrate-mediated clearance of secretory IgA from the circulation. Mol. Immunol. 22: 887–892.
. 1992. The clearance of apoptotic cells in the liver is mediated by the asialoglycoprotein receptor. FEBS Lett. 296: 174–178.
. 2011. Ethanol feeding potentiates the pro-inflammatory response of Kupffer cells to cellular fibronectin. Alcohol. Clin. Exp. Res. 35: 717–725.
. 1998. Circulating cellular fibronectin may be a natural ligand for the hepatic asialoglycoprotein receptor: possible pathway for fibronectin deposition and turnover in the rat liver. Hepatology 28: 475–485.
. 2013. A novel hypothesis for an alkaline phosphatase ‘rescue’ mechanism in the hepatic acute phase immune response. Biochim. Biophys. Acta 1832: 2044–2056.
. 1982. The role of the liver in clearance of glycoproteins from the general circulation, with special reference to intestinal alkaline phosphatase. Pharm. Weekbl. Sci. 4: 57–70.
. 2001. Antigen-specific primary activation of CD8+ T cells within the liver. J. Immunol. 166: 5430–5438.
. 2011. Hepatocyte cytotoxicity is facilitated by asialoglycoprotein receptor. Hepatology 54: 1043–1050.
. 2007. Effect of chronic ethanol administration on the in vitro production of proinflammatory cytokines by rat Kupffer cells in the presence of apoptotic cells. Alcohol. Clin. Exp. Res. 31: 122–129.
. 2002. The effect of ethanol on asialoglycoprotein receptor-mediated phagocytosis of apoptotic cells by rat hepatocytes. Hepatology 36: 1478–1487.
. 2013. Susceptibility to T cell-mediated liver injury is enhanced in asialoglycoprotein receptor-deficient mice. Int. Immunopharmacol. 16: 17–26.
. 2014. Hepatocyte-mediated cytotoxicity and host defense mechanisms in the alcohol-injured liver. Hepatol. Int. 8(Suppl. 2): 432–438.
. 2015. The attenuation of inflammatory liver injury by alkaline phosphatase is impaired in livers lacking asialoglycoprotein receptors: role of the major hepatic trafficking system in detoxification processes. Hepatology 62: 200A.
. 2014. Inflammatory liver injury is associated with altered alkaline phosphatase activity and hepatic asialoglycoprotein receptor function. Hepatology 60: 229A.
. 1996. The major subunit of the asialoglycoprotein receptor is expressed on the hepatocellular surface in mice lacking the minor receptor subunit. J. Biol. Chem. 271: 21160–21166.
. 1997. Expression cloning of a novel scavenger receptor from human endothelial cells. J. Biol. Chem. 272: 31217–31220.
. 2013. The scavenger receptor SCARF1 mediates the clearance of apoptotic cells and prevents autoimmunity. Nat. Immunol. 14: 917–926.
. 2002. SREC-II, a new member of the scavenger receptor type F family, trans-interacts with SREC-I through its extracellular domain. J. Biol. Chem. 277: 39696–39702.
. 2016. Megf10 is a receptor for C1Q that mediates clearance of apoptotic cells by astrocytes. J. Neurosci. 36: 5185–5192.
. 2000. Molecular cloning of a novel scavenger receptor for oxidized low density lipoprotein, SR-PSOX, on macrophages. J. Biol. Chem. 275: 40663–40666.
. 2000. A transmembrane CXC chemokine is a ligand for HIV-coreceptor Bonzo. Nat. Immunol. 1: 298–304.
. 2008. CXCL16/SR-PSOX--a friend or a foe in atherosclerosis? Atherosclerosis 197: 487–495.
. 2001. Expression cloning of the STRL33/BONZO/TYMSTRligand reveals elements of CC, CXC, and CX3C chemokines. J. Immunol. 166: 5145–5154.
. 2004. Critical roles of CXC chemokine ligand 16/scavenger receptor that binds phosphatidylserine and oxidized lipoprotein in the pathogenesis of both acute and adoptive transfer experimental autoimmune encephalomyelitis. J. Immunol. 173: 1620–1627.
. 2004. Chemokines generally exhibit scavenger receptor activity through their receptor-binding domain. J. Biol. Chem. 279: 26807–26810.
. 2009. Stabilin-1 mediates phosphatidylserine-dependent clearance of cell corpses in alternatively activated macrophages. J. Cell Sci. 122: 3365–3373.
. 2008. Rapid cell corpse clearance by stabilin-2, a membrane phosphatidylserine receptor. Cell Death Differ. 15: 192–201.
. 2011. Deficiency of liver sinusoidal scavenger receptors stabilin-1 and -2 in mice causes glomerulofibrotic nephropathy via impaired hepatic clearance of noxious blood factors. J. Clin. Invest. 121: 703–714.
. 2007. Crystal structure of the third extracellular domain of CD5 reveals the fold of a group B scavenger cysteine-rich receptor domain. J. Biol. Chem. 282: 12669–12677.
. 2001. Identification of the haemoglobin scavenger receptor. Nature 409: 198–201.
. 2013. The haptoglobin-CD163-heme oxygenase-1 pathway for hemoglobin scavenging. Oxid. Med. Cell. Longev. DOI: 10.1155/2013/523652.
. 2009. The macrophage scavenger receptor CD163 functions as an innate immune sensor for bacteria. Blood 113: 887–892.
. 2006. The macrophage scavenger receptor CD163: endocytic properties of cytoplasmic tail variants. J. Leukoc. Biol. 79: 837–845.
. 2015. Bovine gamma delta T cells and the function of gamma delta T cell specific WC1 co-receptors. Cell. Immunol. 296: 76–86.
. 2012. CD163-L1 is an endocytic macrophage protein strongly regulated by mediators in the inflammatory response. J. Immunol. 188: 2399–2409.
. 2013. Characterization of a novel human scavenger receptor cysteine-rich molecule SCART1 expressed by lymphocytes. Immunobiology 218: 408–417.
. 2012. Gene number determination and genetic polymorphism of the gamma delta T cell co-receptor WC1 genes. BMC Genet. 13: 86.
. 2009. Genomic organization and classification of the bovine WC1 genes and expression by peripheral blood gamma delta T cells. BMC Genomics 10: 191.
. 2010. Evolution of the CD163 family and its relationship to the bovine gamma delta T cell co-receptor WC1. BMC Evol. Biol. 10: 181.
. 2007. WC1+ gammadelta T cell memory population is induced by killed bacterial vaccine. Eur. J. Immunol. 37: 1204–1216.
. 2005. Gammadelta T cell function varies with the expressed WC1 coreceptor. J. Immunol. 174: 3386–3393.
. 2011. Scavenger receptor WC1 contributes to the γδ T cell response to Leptospira. Mol. Immunol. 48: 801–809.
. 2015. WC1 is a hybrid γδ TCR coreceptor and pattern recognition receptor for pathogenic bacteria. J. Immunol. 194: 2280–2288.
. 2013. RAGE and TLRs: relatives, friends or neighbours? Mol. Immunol. 56: 739–744.
. 2013. Receptor for advanced glycation endproducts (RAGE), its ligands, and soluble RAGE: potential biomarkers for diagnosis and therapeutic targets for human renal diseases. Genomics Inform. 11: 224–229.
. 2016. Critical role of RAGE and HMGB1 in inflammatory heart disease. Proc. Natl. Acad. Sci. USA 113: E155–E164.
. 2013. Cellular signalling of the receptor for advanced glycation end products (RAGE). Cell. Signal. 25: 2185–2197.
. 1997. CD44: structure, function, and association with the malignant process. Adv. Cancer Res. 71: 241–319.
. 2015. CD44: molecular interactions, signaling and functions in the nervous system. Front. Cell. Neurosci. 9: 175.
. 2009. ADAM10 is the constitutive functional sheddase of CD44 in human melanoma cells. J. Invest. Dermatol. 129: 1471–1482.
. 2011. Soluble CD44 interacts with intermediate filament protein vimentin on endothelial cell surface. PLoS One 6: e29305.
. 1992. The hyaluronan receptor (CD44) participates in the uptake and degradation of hyaluronan. J. Cell Biol. 116: 1055–1062.
. 1996. A chondroitin/dermatan sulfate form of CD44 is a receptor for collagen XIV (undulin). Exp. Cell Res. 229: 388–397.
. 1984. Hyaluronate binding proteins also bind to fibronectin, laminin and collagen. Biochem. Biophys. Res. Commun. 121: 808–814.
. 2001. Group A Streptococcus tissue invasion by CD44-mediated cell signalling. Nature 414: 648–652.
. 2005. Bikunin down-regulates heterodimerization between CD44 and growth factor receptors and subsequently suppresses agonist-mediated signaling. J. Cell. Biochem. 94: 995–1009.
. 1999. CD44 signaling through p56lck involves lateral association with CD4 in human CD4+ T cells. Int. Immunol. 11: 1085–1092.
. 2008. CD44 suppresses TLR-mediated inflammation. J. Immunol. 180: 4235–4245.
. 2007. Recognition of hyaluronan released in sterile injury involves a unique receptor complex dependent on Toll-like receptor 4, CD44, and MD-2. J. Biol. Chem. 282: 18265–18275.
. 2006. Acylation of CD44 and its association with lipid rafts are required for receptor and hyaluronan endocytosis. J. Biol. Chem. 281: 34601–34609.
. 2014. Tissue integrity signals communicated by high-molecular weight hyaluronan and the resolution of inflammation. Immunol. Res. 58: 186–192.
. 2011. Hyaluronan as an immune regulator in human diseases. Physiol. Rev. 91: 221–264.
. 2002. Resolution of lung inflammation by CD44. Science 296: 155–158.
. 2004. CD44 potentiates the adherence of metastatic prostate and breast cancer cells to bone marrow endothelial cells. Cancer Res. 64: 5702–5711.
. 2011. ECM components guide IL-10 producing regulatory T-cell (TR1) induction from effector memory T-cell precursors. Proc. Natl. Acad. Sci. USA 108: 7938–7943.
. 2004. CD44 in cancer progression: adhesion, migration and growth regulation. J. Mol. Histol. 35: 211–231.
. 2009. Role of CD44 in the differentiation of Th1 and Th2 cells: CD44-deficiency enhances the development of Th2 effectors in response to sheep RBC and chicken ovalbumin. J. Immunol. 183: 172–180.
. 2009. CD44 costimulation promotes FoxP3+ regulatory T cell persistence and function via production of IL-2, IL-10, and TGF-beta. J. Immunol. 183: 2232–2241.
. 1994. Structures and functions of multiligand lipoprotein receptors: macrophage scavenger receptors and LDL receptor-related protein (LRP). Annu. Rev. Biochem. 63: 601–637.
. 2001. LRP: a multifunctional scavenger and signaling receptor. J. Clin. Invest. 108: 779–784.
. 2010. Lipoprotein receptors--an evolutionarily ancient multifunctional receptor family. Biol. Chem. 391: 1341–1363.
. 2015. In-depth phenotyping of a Donnai-Barrow patient helps clarify proximal tubule dysfunction. Pediatr. Nephrol. 30: 1027–1031.
. 2014. The low-density lipoprotein receptor-related protein 1 and amyloid-β clearance in Alzheimer’s disease. Front. Aging Neurosci. 6: 93.
. 2014. Low-density lipoprotein receptor-related protein-1: role in the regulation of vascular integrity. Arterioscler. Thromb. Vasc. Biol. 34: 487–498.
. 2014. LDL receptor-related protein-1: a regulator of inflammation in atherosclerosis, cancer, and injury to the nervous system. Am. J. Pathol. 184: 18–27.
. 2013. Progesterone induces expression of Lrp2 in the murine uterus. Biochem. Biophys. Res. Commun. 441: 175–179.
. 2017. Obesity and neuroinflammatory phenotype in mice lacking endothelial megalin. J. Neuroinflammation 14: 26.
. 2011. Megalin/LRP2 expression is induced by peroxisome proliferator-activated receptor -alpha and -gamma: implications for PPARs’ roles in renal function. PLoS One 6: e16794.
. 2004. Angiotensin-converting enzyme-2: a molecular and cellular perspective. Cell. Mol. Life Sci. 61: 2704–2713.
. 2003. Angiotensin-converting enzyme 2 is a functional receptor for the SARS coronavirus. Nature 426: 450–454. 2008. Aminopeptidase N in arterial hypertension. Heart Fail. Rev. 13: 293–298.
. 2015. Porcine aminopeptidase N mediated polarized infection by porcine epidemic diarrhea virus in target cells. Virology 478: 1–8.
. 2009. Scavenger receptor B2 is a cellular receptor for enterovirus 71. Nat. Med. 15: 798–801.
. 2013. Structure of LIMP-2 provides functional insights with implications for SR-BI and CD36. Nature 504: 172–176.
. 2012. Human SCARB2-dependent infection by coxsackievirus A7, A14, and A16 and enterovirus 71. J. Virol. 86: 5686–5696.